Lead singer Jon Bon Jovi (John Francis Bongiovi) began to play piano and guitar at thirteen, learning Elton John songs. At that same age, Bon Jovi founded his first band, called Raze. Jon enrolled in St. Joseph's Highschool in Metuchen, NJ originally, but was asked to leave before entering his sophomore year for an unknown violation. He went on to attend Sayreville War Memorial High School. At sixteen Bon Jovi met David Bryan (David Bryan Rashbaum) in high school (Sayreville War Memorial High School ) and founded an R&B cover band with him named Atlantic City Expressway. They played at New Jersey clubs, even though they were minors. Still in his teens, Bon Jovi played in the band Jon Bon Jovi and the Wild Ones, playing New Jersey clubs like the Fast Lane and opening for known acts in the area. By the summer of 1982, out of school and working part-time - including in a shoe store - Jon finally got a job at the Power Station Studios, a Manhattan recording facility where his cousin, Tony Bongiovi, was the co-owner. Bon Jovi made several demos (including one produced by Billy Squier) and sent them out to many record companies - but failed to make an impact. At nineteen, Bon Jovi had his first recording experience, singing the song "R2-D2 We Wish You a Merry Christmas" by Meco Monardo and Daniel Oriolo on a Star Wars Christmas album, Christmas in the Stars, produced by Tony Bongiovi at the Power Station and released on the RSO label. In 1983, local radio station WAPP 103.5FM "The Apple" had a contest, held in conjunction with St. John's University, to search for the best unsigned band. Bon Jovi used studio musicians to play on the track "Runaway" (which was written in 1980). After it won the contest, it became an instant hit in the summer of 1983. The studio musicians who helped Jon Bon Jovi to record "Runaway" were known as "The All Star Review" and they were Tim Pierce (guitar), Roy Bittan (keyboards), Frankie LaRocka (drums) and Hugh McDonald (bass). Bon Jovi now desperately needed a band. The soon-to-be-members of the band had crossed paths in their earlier days, but the current lineup didn't come together until March of 1983. Bon Jovi gave Dave Bryan a call, who in turn called Alec John Such and Tico Torres. A succession of guitarists followed, until Richie Sambora signed on. Such talked Bon Jovi into letting Sambora show what he could do, and Bon Jovi loved it. Before joining Bon Jovi, Sambora had toured with Joe Cocker, played with a group called Mercy and had just been called up to audition for Kiss. He also played on the album Lessons with the band Message, which was re-released on CD through Long Island Records in 1995. Message was originally signed to Led Zeppelin's Swan Song label, although an album was never released through them. Tico Torres was also an experienced musician, having recorded with Miles Davis and playing live with The Marvelettes and Chuck Berry. He had played on twenty-six records and had recently recorded with Frankie and the Knockouts (a Jersey band with hit singles in the early 1980s). David Bryan was a natural recruit. He had quit the band he and Bon Jovi founded while in college, then quit college to attend Juilliard School, the prestigious New York music school. Bon Jovi was now a band, and when they opened for the band Scandal, they caught the attention of record exec Derek Shulman, who signed them to PolyGram. With the help of their new manager Doc McGhee, the band's debut album, Bon Jovi, was released on January 21, 1984. The album went gold in the US (sales of over 500,000) and was also released in the UK. The group found themselves opening for ZZ Top at the Madison Square Garden (before their first album had been released), and for Scorpions and Kiss in Europe. They also made an appearance on American Bandstand. In 1985 Bon Jovi's second album 7800° Fahrenheit was released, but the response was poor. The leading British metal magazine Kerrang!, who had been very positive about the debut record, called the album "a pale imitation of the Bon Jovi we have got to know and learned to love." Jon Bon Jovi himself later said it could have and should have been a better disc. Their third album, Slippery When Wet, shot the band to superstardom around the world with hits such as "You Give Love a Bad Name", "Livin' On A Prayer", and "Wanted Dead or Alive". Bon Jovi has said the album was named after the ubiquitous highway warning signs, but Bryan has said the following about the album's title: "During the recording of the record we frequently wound up in a striptease club where incredibly good looking girls were putting water and soap on each other. They became so slippery because of that, that you couldn't hold on to them even if you wanted to really bad. 'Slippery when wet!' one of us yelled out and the rest of us immediately knew: that had to be the title of the new album! Originally we were going to put a picture of some huge breasts, the really big ones, on the cover; but when the PMRC (a moral board under command of Tipper Gore, wife of former Vice President of the United States Al Gore) found out we were in big trouble. So we made it into a very decent cover." The album has sold in excess of 12 million copies since its release in late 1986. On the tour that followed, singer Bon Jovi began having vocal difficulties. The extremely high notes and unrelenting schedule threatened to damage his voice permanently. With the help of a vocal coach, he made it through the tour. Bon Jovi has tended to sing slightly lower pitches since then. The next album from Bon Jovi was New Jersey released in 1988. The album was recorded very shortly after the tour for Slippery because the band wanted to prove that they were not just a one hit wonder. The resulting album is a fan favorite, with hit songs such as "Bad Medicine" and "Lay Your Hands On Me" which are still nightly stalwarts in their live repertoire. However, New Jersey almost led to the end of the band as they went straight back out on the road so soon after the heavy touring for their previous album. This constant living on the road almost destroyed the strong bond between Jon Bon Jovi and Sambora. The band, however, made it through and took a healthy break before their next studio effort. Between 1990 and 1992 the band members went their separate ways for a while. Bon Jovi made the soundtrack for the movie "Young Guns II", helped by Elton John, Aldo Nova and Jeff Beck among others. Sambora released a solo album, Stranger in This Town, in 1991. Bryan made the music for the movie The Netherworld, but also ended up in the hospital with an illness due to a South American parasite. Torres avoided music and the music business altogether. Such took a fall off of his motor, that he had to develop a whole new way to hold his instrument. Eventually the band returned with the album Keep the Faith in 1992. The album featured a more mature sound and contained more serious lyrics. It included the hit singles "Bed of Roses", "Keep the Faith" and "In These Arms". It also features fan favourites like the epic "Dry County" and "I Believe". In 1994, Bon Jovi released a "greatest hits" album entitled Cross Road, which also contained two new tracks: the hit singles "Always" and "Someday I'll Be Saturday Night", as well as a new, updated rendition of "Livin' on a Prayer". Such left the band after this album. While he has not been officially replaced, Hugh McDonald has handled studio and live bass duties since then. Bon Jovi said, regarding the departure of Such: "Of course it hurts. But I learned to accept and respect it. The fact that I'm a workaholic, studio in, studio out, stage on, stage off, want to be dealing with music day and night, doesn't mean everyone else has to adjust to that pace. Alec wanted to quit for a while now so it didn't come as a complete surprise." With the 1995 album These Days, Bon Jovi took the mature rock sound they had developed on Keep the Faith further. The record as a whole was darker and more downbeat than the usual Bon Jovi fare, and as a result, despite critical kudos, it spun off only one hit single in the US, "This Ain't A Love Song" and it sold "only" a little over a million records. Nevertheless, the other tracks proved sufficiently popular to garner various successful European singles. In 1996, Jon Bon Jovi claimed in an interview with the German Bravo magazine that, due to the overwhelming success of the These Days Tour, the album had sold in excess of 20 million copies worldwide. It was on the These Days Tour, that Bon Jovi played at Wembley Stadium in 1995 on a sell-out three night's running concert. It is widely considered to be their best rock concert, featuring such hits as "Livin' On A Prayer", "Keep the Faith", an excellent, heart-felt rendition of "Always", and showcasing new songs from These Days. It is particularly memorable because it is the same weekend that the album got to No. 1 in the UK charts. This tour date can be viewed on video, and has been re-issued on DVD, both titled Live From London. After a nearly three-year hiatus during which several band members worked on independent projects, Bon Jovi regrouped in 1999 to begin work on their next studio album. Their 2000 release, Crush, enjoyed overwhelming success both in the US and overseas, thanks in part to the smash-hit single "It's My Life", co-written by famous Swedish producer Max Martin. Crush, which also produced such hits as "Say It Isn't So" and "Thank You for Loving Me", soon became the band's most successful album since Cross Road, and helped introduce Bon Jovi to a new, younger fan base. The Crush Tour, which began that summer, originally encompassed only 60 or so shows and was extended due to Bon Jovi's newfound popularity, with the band remaining on tour through mid-2001. While on tour, Bon Jovi released a collection of live performances from throughout their career in an album entitled, One Wild Night: Live 1985-2001. Shortly after the September 11, 2001 terrorist attacks, the band performed as part of the historic star-studded The Concert for New York City benefit concert for victims and their families. They performed an acoustic medley of "Livin' on a Prayer" and "Wanted Dead or Alive" with a stirring finale of "It's My Life". In late 2002, Bounce, the band's follow-up to Crush, hit stores. Though Bounce did not enjoy quite the level of success of its predecessor, the album did produce the hit singles, "Everyday" and "Misunderstood". The band went on a U.S. tour for this album, during which they made history as the last band to play Veterans Stadium in Philadelphia before it was torn down. The band also released a promotional album through Target. The album featured eight demo and live tracks. Following the Bounce Tour, which wrapped up in August 2003, Bon Jovi embarked on what would become a unique and ambitious project. Originally intending to produce an album consisting of live acoustic performances of various songs, the band ended up rewriting, re-recording and reinventing 12 of their biggest hits in a new and much different light. This Left Feels Right was released in November 2003, with the title referring to the "left turn" of sorts that the band took in redoing the songs heard on this record. The following year the band released a box set entitled 100,000,000 Bon Jovi Fans Can't Be Wrong, the title an homage to Elvis Presley's 50,000,000 Elvis Fans Can't Be Wrong. The set consisted of four CDs packed with 38 unreleased and 12 rare tracks, as well as a DVD. The box set marked the sales of 100 million Bon Jovi albums and also commemorated the 20th anniversary of the release of the band's first record in 1984. In November 2004 Bon Jovi was honored with the award for Merit at the American Music Awards. 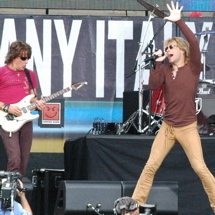 Bon Jovi participated in Live 8 on July 2, 2005. A new song, "Have a Nice Day", was debuted at the event, alongside the classics, "Livin' on a Prayer" and "It's My Life". On August 20th, 2005 Bon Jovi headlined Miller Brewing Co.'s Big Brew-Ha, celebrating its 150th anniversary. The free stadium concert at Miller Park in Milwaukee included one preview song from the band's forthcoming album. In September 2005 Bon Jovi was honored with the Diamond Award at the World Music Awards for selling 100 million albums. Bon Jovi's long-awaited new album, Have a Nice Day, was released on September 20th, 2005 (U.S.), followed by an international tour which kicked off in early November. The album topped the charts around the world, landing on the number two spot on Billboards the first week of sales. Bon Jovi had a career-best first week, selling over 202,000 albums. "Have a Nice Day" was the first single off the new album, and debuted at radio worldwide on July 18, 2005. The second single, "Who Says You Can't Go Home", has since debuted as well, including a duet version with country singer Jennifer Nettles of the band Sugarland. The third single off the album is entitled "Welcome to Wherever You Are". Soon after the release of Have A Nice Day, the band started gearing up for a new 2005/2006-world tour. This tour - being shorter than previous ones with only seventy-five shows - brings the band to numerous stages and arenas throughout the world. Originally it was planned for them to be the first act to perform at the new Wembley Stadium, however, the construction company Multiplex who are behind the stadium's rebuilding project have said that the stadium will not be ready until 2007. The concert has therefore been moved to to the Milton Keynes National Bowl with the same performance dates. Following dates in Japan and Europe, Bon Jovi will return to the US in the summer of 2006 for a massive stadium tour, including 3 shows in the band's native New Jersey at Giants Stadium. On January 21, 2006 in Hamilton, Ontario, Bon Jovi's plane overshot and skidded off the runway after a show in Buffalo; none of the band members were harmed. On February 7, 2006 a promotional album, Live from the Have a Nice Day Tour, was released through Wal-Mart. It contains six live tracks recorded in December 2005 in Boston. On February 19, 2006, Bon Jovi performed as the headlining act prior to Nascar's Daytona 500. The band performed "It's My Life" and their two new singles "Have a Nice Day" and "Who Says You Can't Go Home", the latter with Jennifer Nettles. Bon Jovi has sold more than 33 million albums in the United States. and over 100,000,000 albums worldwide, and has played live concerts in major cities in Asia, Europe, Australia, Canada, and South America, in addition to a large number of cities in the U.S.